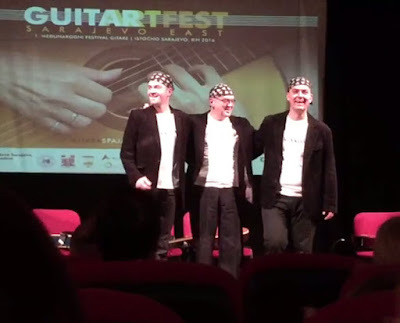 This week it was also the location of Guitartfest, a festival of guitar music, with a program that included Trio Balkan Strings playing Hava Nagila. We have posted more than 50 versions of Hava Nagila, but this is the first Sarajevo version that we have encountered. Living in a country once marred by sectarian conflict, Jewish leader Jakob Finci says his 1,000-strong community ‘feels safe’ 20 years after the end of the Bosnian War. Although the small Jewish community currently only numbers approximately 1,000, Finci said that Jews are also equal partners amid a majority Sunni Muslim population because of their long tradition and presence in the region. “I think this is very important, especially taking into account all the activities during the last war when we were able to help non-Jews,” he said. “We really did our best to help everyone without questioning who they were, what was their religion or anything else.”Finci’s office is located in Sarajevo’s Jewish community center. Unusual for a Jewish institutional building in Europe, it has no security.“Here, [in Sarajevo] we feel very safe,” he remarked. Well, enjoy the solitude while it lasts, Mr. Finci, it never lasts for long. See you soon in Eretz Yisrael.